DETROIT -- Former General Motors Co. powertrain executive Bob Purcell, will become chairman and CEO of Protean Holdings Corp., a fledgling developer of in-wheel electric drive systems. Purcell, 58, who retired from GM in 2008, had been a board member and adviser to Protean. He replaces Craig Knight, 55, who becomes president of Protean Americas and executive vice president of global business development. 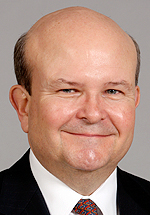 Purcell formerly was vice president for global sales planning and strategic alliances at GM Powertrain. From 1994 to 2002, he headed GM's Advanced Technology Vehicles unit, which developed the EV-1 electric vehicle. Purcell also was chairman of the GM-Ovonic advanced battery joint venture. Currently, Protean is running test vehicle programs with Millbrook Vauxhall for a hybrid Vivaro van, with Brabus for a battery-electric Mercedes-Benz E class and with Volkswagen AG for a rear-wheel electric braking system on the Polo. In an interview yesterday, Purcell said Protean is targeting production-vehicle programs. “We are in what I would consider substantive discussions with a number of manufacturers, automakers as well as commercial-vehicle makers,” Purcell said. Because in-wheel-drive systems house both the power source and electric controls in the wheels, they can serve as “bolt-on” systems that allow automakers to convert existing vehicles to electric power, he said.